You’d think that a windy wet day on the Lake Huron shore might prove to be anything but productive but it was. The low expectations were met for most of the walk. It was nice to hear the waves crashing onto the isolated beach at Tawas Point and, thanks to the misty rains, to actually be isolated from public crowds. But there wasn’t much wildlife moving about. There were no shorebirds, sand wasps, tiger beetles or any of the sorts I usually seek out in these dunelands. There were dozens of Ring-billed Gulls standing on the open beach beyond the “no admittance” sign (where the endangered Piping Plovers are nesting). All were facing into the wind and the group was being supported on exactly half the number of legs normally expected of such a flock because they were all balancing on one leg apiece. A wind-battered Buckeye was the only flier other than some swallows who matched the wind gust for gust. Perhaps because of the lack of activity, I was forced to look sandward at the track evidence. There were, of course, numerous web-toed gull traces. 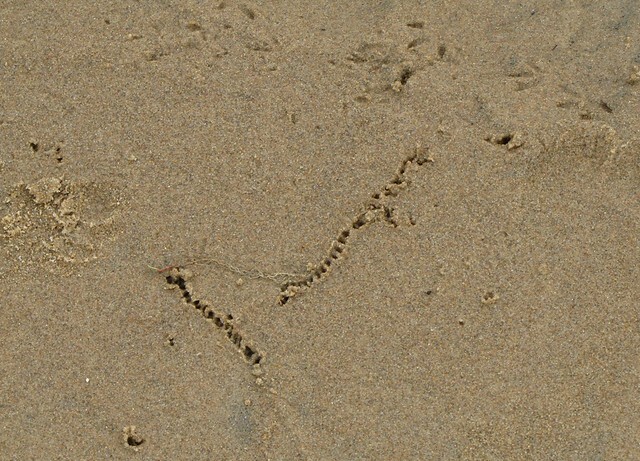 The simple three-toed pattern of multiple small shorebirds imprinted the edge of the inter-dune ponds. They followed the edge of the shallow water for the most part. 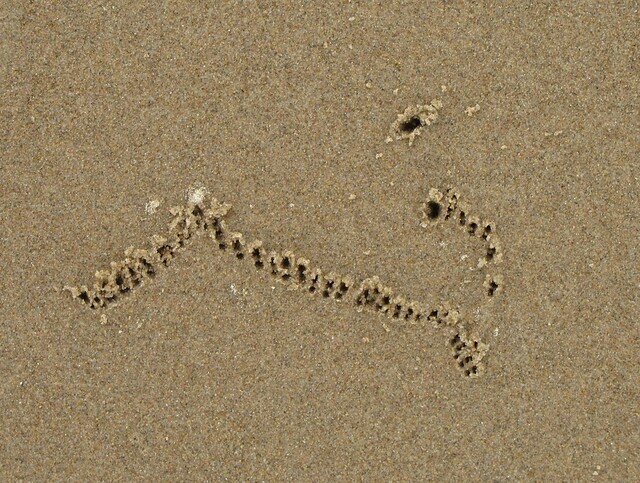 Singular holes, created by their probing beaks, pock-marked the sand. In some stretches strange hieroglyphic letters and wiggles also marked extensive stretches of the wet sand (see above and here). 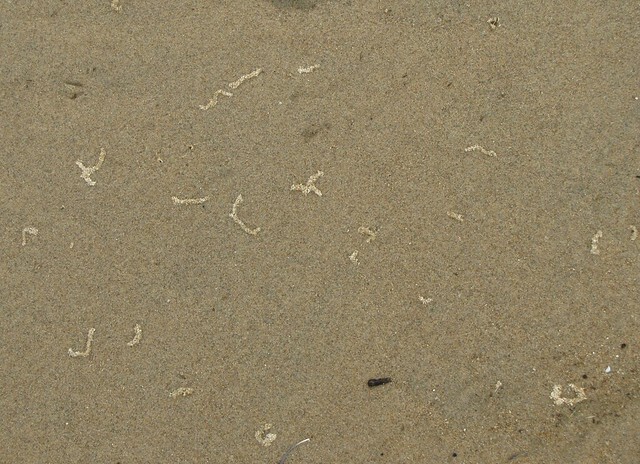 There was some micro-mole type creature living within these sand lines – tiny openings at the end of some of the trials proved as much. The raised grains were drier than the darker background and were clearly outlined, but some of the tunnels obviously continued down into the wet sand. By the looks of things, there were thousands of these tunnels and thousands of tunnel makers. In places where the shorebird and hieroglyphs met, a third type of marking evidenced where the birds were working these wiggle marks with systematic thrusts of an open bill. They were starting at one end and poking millimeter by millimeter down the line until – whatever it was – was found, escaped, or the hole turned out to be dry. I opted to try the same tactic. Taking my finger and collapsing the tiny ridges, I became a giant sandpiper on this day. Many of the tunnels yielded nothing except, well, collapsed patterns in the sand. A fascinating few of the tunnel investigations resulted in a tiny explosion near the terminal end. 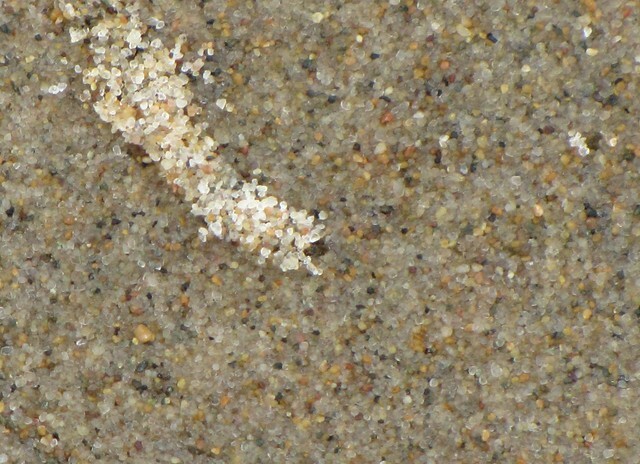 In a motion quicker than the eye could catch something would erupt out of the tunnel – spreading a small shower of sand grains and leaving an opening. 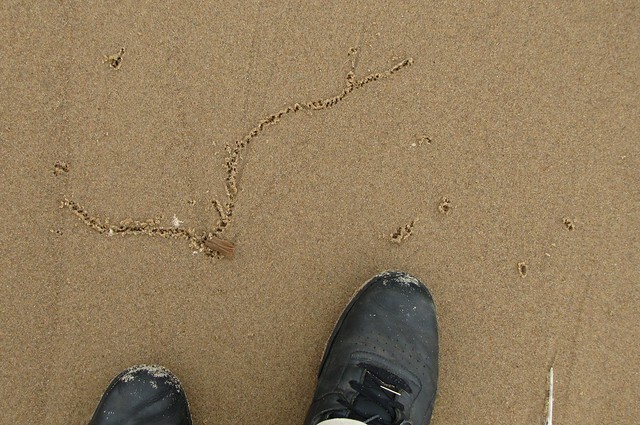 There was no obvious creature landing in the nearby sand, however, and that was intriguing. It was difficult to catch on camera, but I do have a short video clip to show the incredible details (o.k., the mildly interesting details). These were tiny holes – only a few millimeters across – so the critter had to be hard to see just by matter of scale. After a series of trials, I finally trained my eye to spot the fleeing tunnel makers. 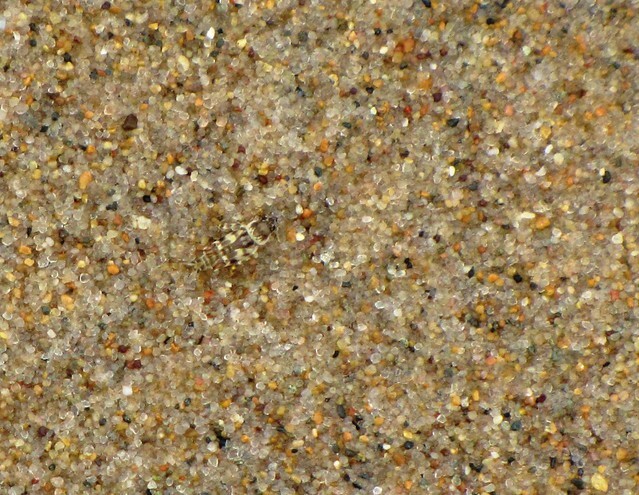 Not only were they micro-sized but also cryptically colored to blend into the speckled sand (see below). Their surprising trajectory took them well beyond expected range to about 4 or 5 inches from their starting point. It was impossible to nab any of these things in hand (I needed a beak but was without one at the time). Pushing the full capacity of my camera zoom, I did catch a few images (see above, below & here). If this were an ocean beach I’d be talking about “sand fleas” at this point but this was an inland sea beach. These things looked like grasshoppers but nothing about this scenario, except the jumping, smacked of grasshopper. Let me say that I enjoyed the ignorance created by this whole affair and the identity challenges were both thrilling and frustrating but, for the purposes of this blog and your patience, I will now cut to the chase and leave out the details of the chase. 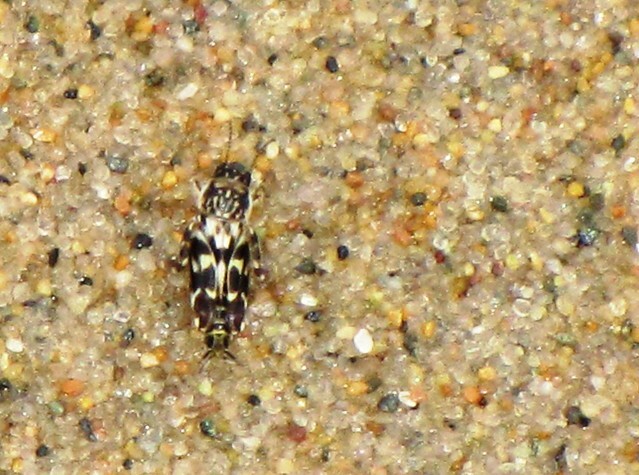 These burrowing creatures were Pygmy Mole Grasshoppers. Appropriately enough, this species is known as the Minute Pygmy Mole Grasshopper. How’s that for being called a speck on a fly’s rear-end! Only 4 mm long, MPMGs are the smallest of the cricket and grasshopper group and perhaps the oddest. They inhabit moist sandy soil bordering streams and lakes throughout the eastern U.S. and feed upon the algae growing between the sand grains. Up close, getting beyond all those cryptic patterns, they have scoop-like front legs for digging, reduced wings (so they cannot fly), and huge jumping legs. The end of each back leg has a set of flattened paddles – no doubt for sand walking or swimming (see my drawing below). Being confined to soil dwelling as they are, it is surprising that Minute Pygmy G-hops have such well-developed jumping legs. Yes, they are grasshoppers but they do not hop in the grass. You do not see moles doing much jumping do you? The ability to burst through the roof of a tunnel and “fly” through the air is a great predatory evasion technique. They are world-class jumpers at that. For such a creature to jump 5 inches is equivalent to a human jumping nearly 14 feet. Consider that the world record standing long jumper is Arne Tvervaag who sailed 12.17 feet back in 1968. Arne did not accomplish his task by bursting through a sand roof as far as I know. Finding a useless fact, like the one just quoted, is easy and instantaneous on Wikipedia. Finding Minute Pygmy Mole Grasshoppers is not an easy thing. According the rest (non-Wikipedic) information out there the best, and only time, to locate them is after a rain when their tunnels become evident. It was fortuitous that I was on that wet Michigan beach to discover something I had no idea existed. It’s hard to get excited about an animal which looks about the same when alive as when dead. The public perception of clams and mussels has been tarnished by this fact over many years and these creatures rarely make it into the limelight. After all, it is considered good to “come out of one’s shell” and bad not to. Unfortunately a clam out of its shell is a dead clam (the first way to tell a dead from a live clam). Clams don’t flush like an exploding covey of quail when discovered, or take fin like a lunker trout tearing across a riffle. No, they just sit there and, if they are disturbed enough, simply “clam up” with one quick shutting motion. If they are dead, they don’t clam up (another way to tell the difference). All of this is not to say that the perception is the reality. In fact, clams can be downright fascinating and even, dare I say it, ingenious. First of all, our clams are not actually clams at all. 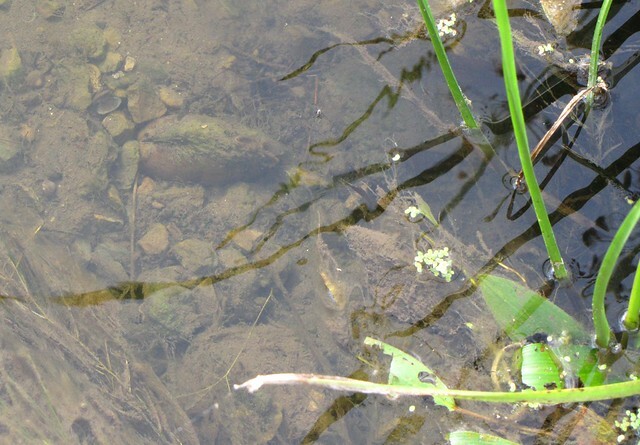 They are freshwater mussels – two shelled (bivalve) members of the mollusk clan. Though limited in structural design, they display a wonderful array of shell design, pattern, size, and color and possess some of the best animal names ever. Where else can you see individuals named Pigtoe, Purple Heelsplitter, Three-horn Warty Back and Fat Mucket without going to a mafia convention? And, I know this may be shocking, but they really do move. You’ll never truly really appreciate any of this until you spend some time observing them (try doing that with a mafia gang and it could get you swimming with da fishes). The shallow waters of the River Raisin just north of the Telegraph Bridge offered just such an opportunity recently. Like I said earlier, these shellfish are not hard to approach once found and I found them close to the seawall lining the bank at that location. The mussels of note were Wavy-rayed Lamp Mussels. True to nature, they were well embedded in the gravelly sediment with only the top third of their form exposed to the current. Because they are relatively immobile, their shells were covered with matted dark algae. They looked like the surrounding rocks for the most part. A set of pink “lips,” kissing the current as it were, were the only give-away. These opening, called siphons, are the in and out tubes for feeding and feces. The forward opening is the incurrent siphon and it is the largest of the two. Edged with a fingerlike fringe and patterned with bold stripes, the incurrent siphon takes in food particles suspended in the water. The particles stick to the mucus covering and are conveyed to the internal mouth (not associated with the aforementioned fake lips). The excurrent siphon blows out the filtered water and waste products. 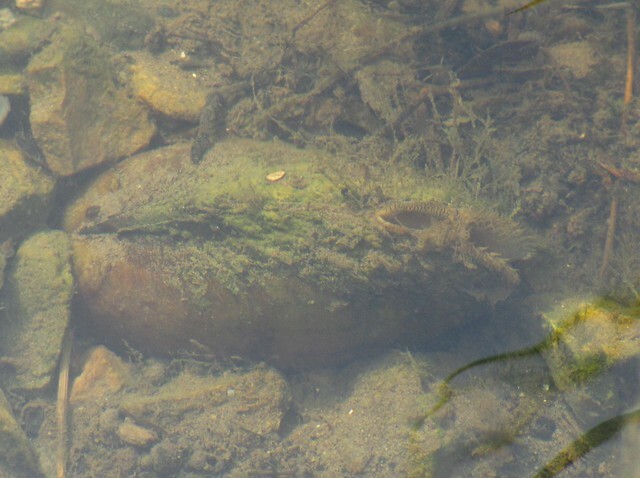 As you might imagine, the mussel usually tries to position itself so that the wastes are ejected downstream from the intake (in other words, never spit upwind). The soft inner workings of a mussel are covered by a thin mantle of flesh. The mantle produces the hard shell which in turn protects the whole shebang. Wavy-rayed Lamp Mussels have an oval shell with a yellowish outer skin layer marked by darker ridges that follow the edge contour. These ridges are believed to be growth lines delineating the annual periods of growth (very much like those on a tree). The River Raisin Lamp mussels exhibited at least ten lines each and reflected a decade of living in the river – through periods of raisin and fall’n water (a local joke around here). The Raisin River has been, in spite of its name, falling as of late due to the extended drought conditions. 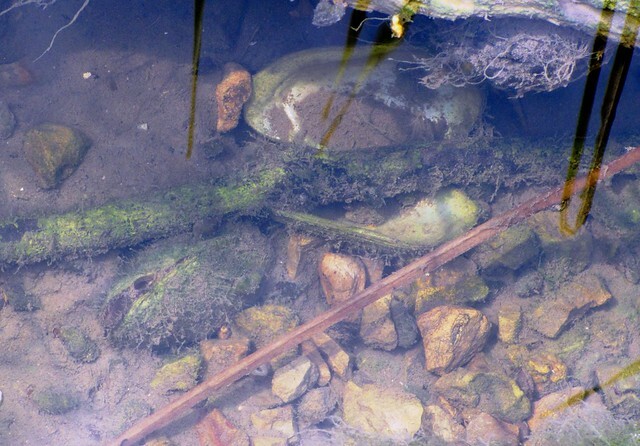 Some areas of the stream were getting too shallow for a mussel’s tastes. I spotted one individual in the process of shifting his position downstream (don’t ask me how I know it was a male – trust me). 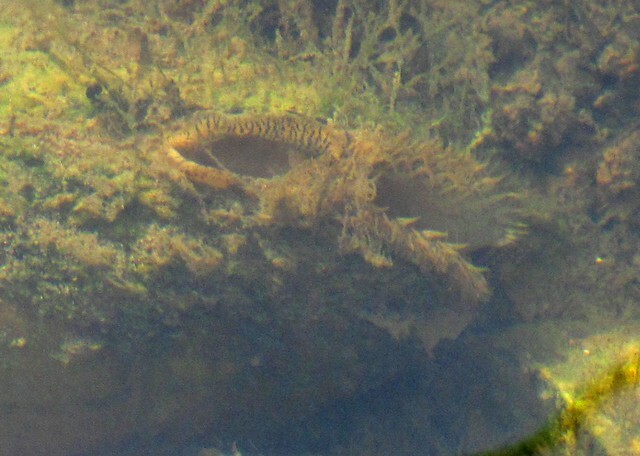 It was attempting to haul shell over a rocky platform in the river bed. 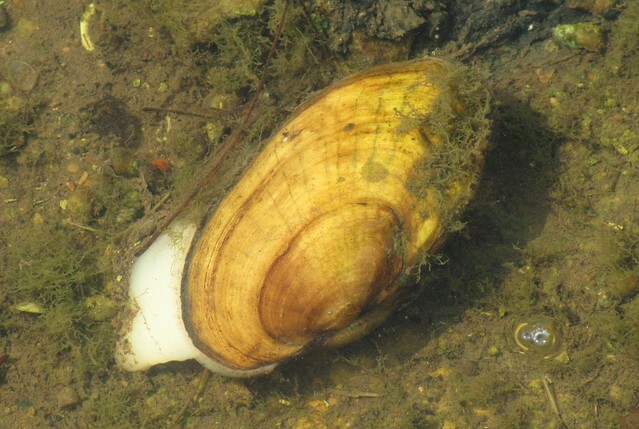 Extending a huge white foot from the parted shell, the mussel wedged the tip into a crevice, swelled the tip in order to anchor it into place, and then contracted its foot. This mussel muscle action acted to pull the shell forward. I even have a video to show you this, but you must be patient while viewing it. Patience pretty well sums up the life of a mussel and a mussel watcher. Perhaps this glimpse into the secret life of Lamp Mussels will shed some needed light on the subject (not a local joke around here yet, but perhaps it could become one!). It’s about time to talk about butterflies again. Not that I’ve neglected the subject entirely, but it hasn’t come up as often as it probably should. It’s safe to say I was raised on the love of the scaly winged tribe and that I’ve never strayed from them as a naturalist. As a blogger, however, I will admit to being unnaturally swayed by birds and other such larger critters. Perhaps the reason might be that these types of things don’t usually require much background explanation and that I can be lazy at times. It wasn’t laziness that prompted my latest trip out to the grassland park just outside Dundee – West County Park, or something like that. The trip was taken at mid-day and the day was already getting hot, so you could say that stupidity overruled laziness in this case. The place is wide open and exposed. Frankly, it was the wrong time to expect much of anything other than prairie plants (another subject I have neglected and one which shall remain neglected for some time to come). Apart from spotting a few skippers of the Silver-spotted kind, a Buffalo Treehopper (look that one up because I don’t want to explain it right now) and some Cabbage Whites, the one mile trek was approaching the self condemning “see, I told you so” stage as I closed to within 100 feet of my car. Yes, I also discovered a beautifully precise Goldfinch nest (complete with four beautifully precise eggs) but, given the introductory theme of this entry, I should not elaborate on this. 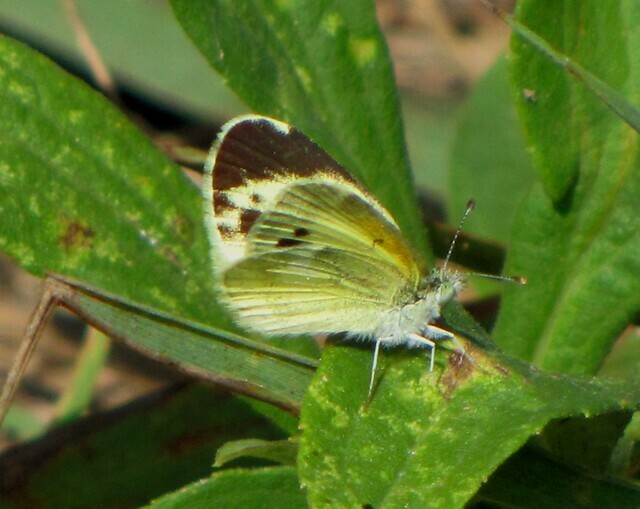 A petite yellowish butterfly caught my eye as it raised up off the trail not 50 feet from my car. There are a whole host of obscure grass moths that fit the description of this individual and I rarely take much notice. But because this one persisted in it’s giddy flight and kept close to the ground, my interest was piqued. It flew like a butterfly. Most of the familiar butterflies in this size category are blue or dark in color (see, there is one of those requisite explanatory notes). Unfortunately, this mini-butterfly refused to land. It remained on the path route but was causing me to retrace my route. After what seemed like a quarter mile Will ‘O the Wisp chase, I gave up. I wasn’t THAT interested. Returning to the original spot close to my car I was greeted by the sight of yet another example of this petite yellow creature. This one also flew but, praise to the patient Prairie Gods, it soon landed and allowed me to approach. Now I can’t say that I knew the following fact right away but I found myself nose to proboscis with a Dwarf Sulphur. This, of course, needs further explanation in order to explain my delight. This species is not an everyday resident in my neighborhood. Dwarf Sulphurs are common butterflies elsewhere but not at all common in Michigan. I could even go so far as to say they are quite rare in the state. It probably should be no surprise that I had never seen one before. 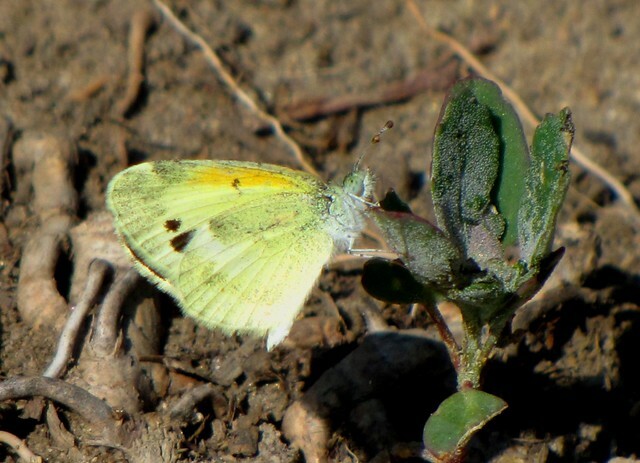 Also known as the Dainty Sulphur, Nathalis iole, and a few other names, the tiny butterfly is a member of the White family. It is related to Cabbage Whites & Clouded Sulphurs, those white & yellow flutterbys of mid summer fields. They are half the size of their fellow Whites but share the family look. 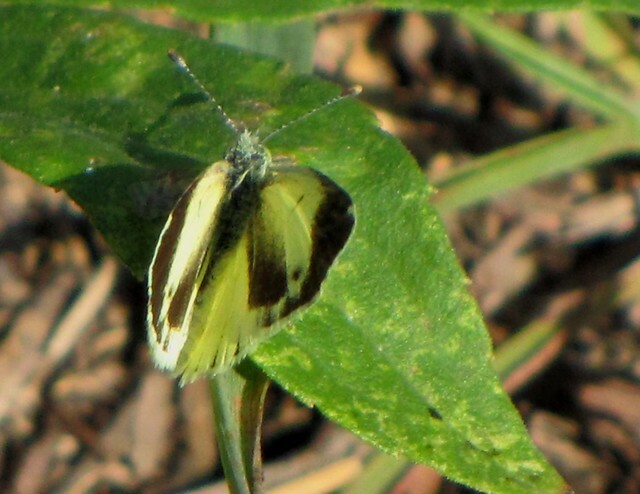 Overall a light yellowish white with a tendency toward bright yellow on the under portion of the forewings, the upper wings are marked with prominent dark patches fore and aft. Two clear freckles fill the space between the patches and serve as clear identifying marks. Large eyes, furry body, and yellow tipped matchstick antennae complete the picture. They have the distinctive habit of flying close to the ground. Dwarf Sulphurs are southern butterflies, ya’ll. It is not unusual for southern insects to spread north every now and then in a phenomenon called an “irruption.” A reverse of the human snowbird phenomenon, the summer irruptors move north and stay until the cold weather drives them back. They can not withstand our winters. The pattern of irruption is sporadic (say that last phrase three times and you’ll have a perfect morning tongue workout). In the case of southerners, extended periods of warm weather provide the main incentive. In other words, when Kentucky weather comes to Michigan the Kentuckians follow. Buckeye Butterflies, another basically southern type, have been coming north nearly every summer in recent memory and are common county residents. 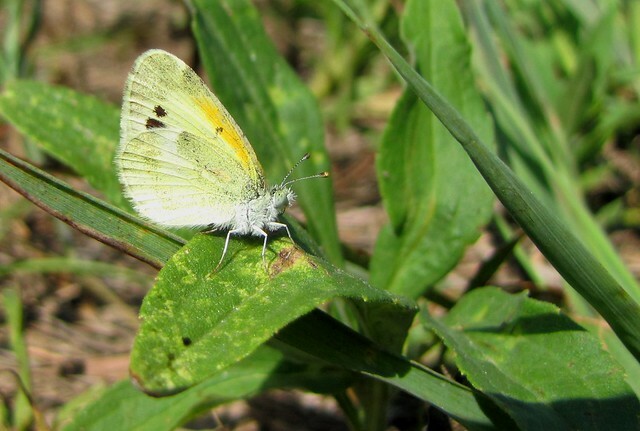 Unlike the Buckeye, the dainty Sulphur is not a regular in this regard. They are true southerners which are even rare in the buffer states such as Ohio (excuse my reference to Ohio as a buffer but it is the place where the south gradually fades into the north). The records in that state are scattered at best. There have been quite a few Dwarf Sulphurs spotted this year and my sightings up in Michiganland confirm that this is a genuine irruptive year. So there you have it. A delicate small southerner makes the news – at least within the delicate small world of my blog. 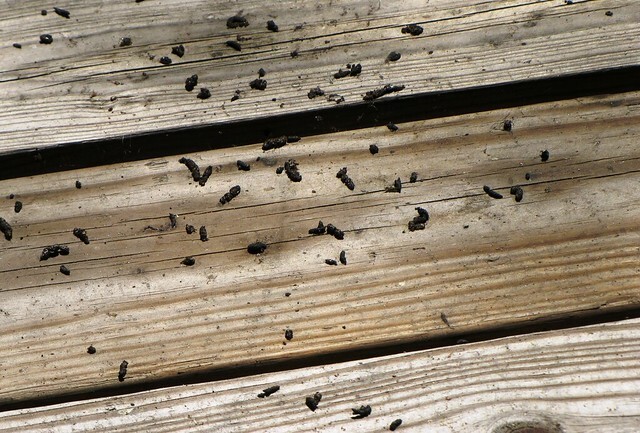 The small pile of droppings at the far edge of the porch were a sure indication that a bat (or bats) were using the spot above it as a rest station. I assumed the place was a “night roost” – a place where a feeding bat will rest in-between midnight forays. Such spots are used only at night and are fairly open (day roosts are in protected cavities, cracks, holes and otherwise tight spots). Dropping evidence is often the best way to tell if bats are about. 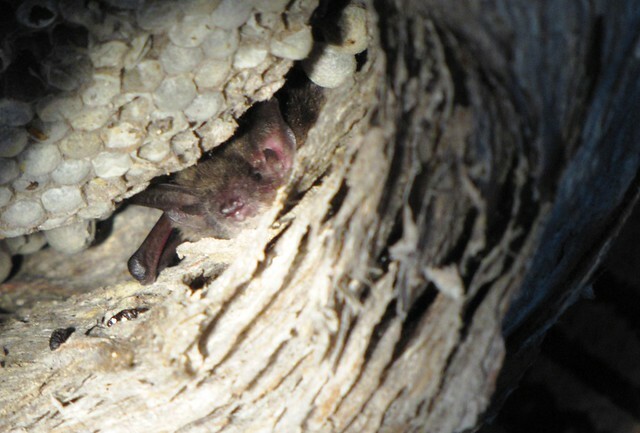 Big Brown Bat doo is mouse-sized (as in the size of mouse droppings – not the size of mice!) and full of beetle parts. You can see the shiny bits of exoskeleton and elytra (wing covers) as evidence that these bats are beetle specialists. Little Brown Bat doo is smaller, as you might expect, but I won’t go further into this discussion because I do not know enough about the fine points of bat bowel movements to continue. Let’s just say that I know it when I see it and I always saw it at the edge of the porch. There is an old hornet nest, the lower half missing, located directly above the dropping scatter. 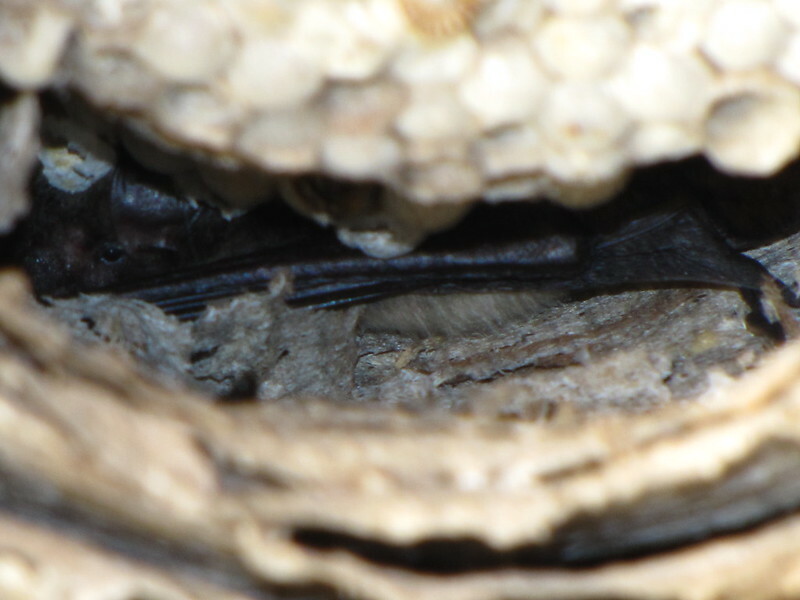 It was apparent that the bat was using this nest as a hanging point. Because it is in a protected location the paper structure has survived for at least three years. 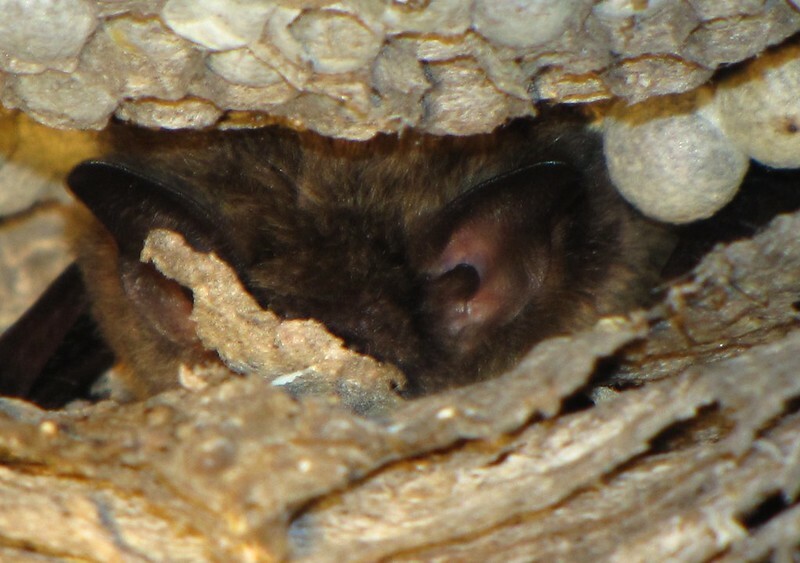 Every time I visited the cabin I peered up into the folds of the old nest to see if a bat remained within its folds, but without any luck – well, that is, until last week. On my last visit I cleared away all of the old dropping to see if there was any fresh activity. Over the course of the next 12 hours, four fresh droppings appeared at the spot. This was ample proof that the place was still in use. It did seem, however, that at least two of the droppings were deposited during the daytime, so my night roost theory was in danger. But, the fact remained that I could not see any daytime bat. Curiosity finally got the better of me. I broke out a flashlight and a ladder and visually probed the dark spaces deep within the nest. My effort was greeted by a view of a pink ear (see here), a patch of silky fur, and the bony forearm (see here) of a single Big Brown Bat tucked deep within. The nest was a day roost after-all. Structurally, the choice makes perfect sense. 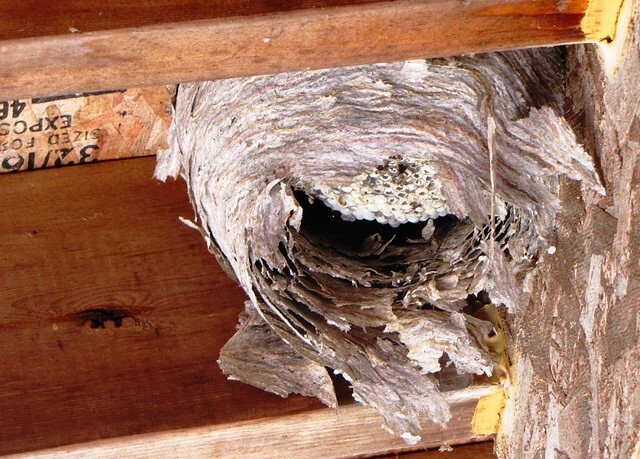 Hornet nests are constructed of durable wood pulp paper and are layered. The inner space surrounding the comb is the perfect dimension for a bat body (they like full body contact with their dwelling surfaces). 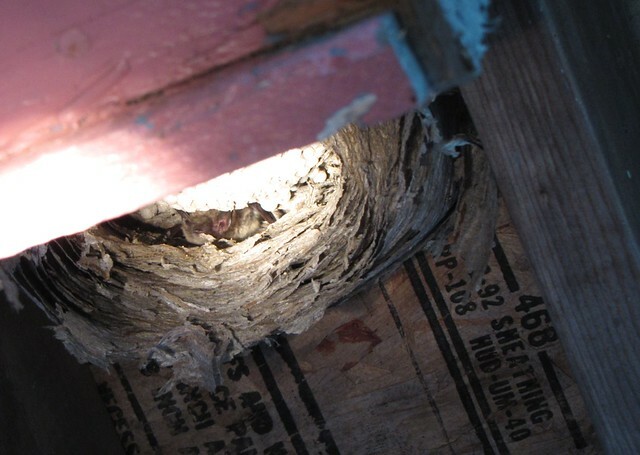 Because they are constructed by flying critters, they are also situated in places where there is plenty of air space beneath the nest for easy egress (and digress?). Of course, this nest would not have been suitable for any bat occupation until after the colony died off and after the lower half fell off. I’m not sure there is any documentation for this type of roost in the literature, but here it is now. The bats around Dollar Lake come out to feed around 9:30 pm this time of year (being 20 minutes past sunset). I was hoping to catch this fellow in action as he dropped out of the roost to start his evening shift. As other bats were spotted flitting about over the cabin at 9:30, my hornet-house bat remained in place. It shuffled around a bit, but made no forward movement. I figured it was my flashlight that was preventing his departure, so I backed off and tried to give the spot more of an indirect illumination. I temporarily left at 9:40 pm in order to restore my neck vertebrae after starring straight up for near 20 minutes. When I returned, he was gone. As I mentioned before, this situation – the combination of bat and hornet house – is at least three years old and I suspect that the same bat has been using it each summer over that time. 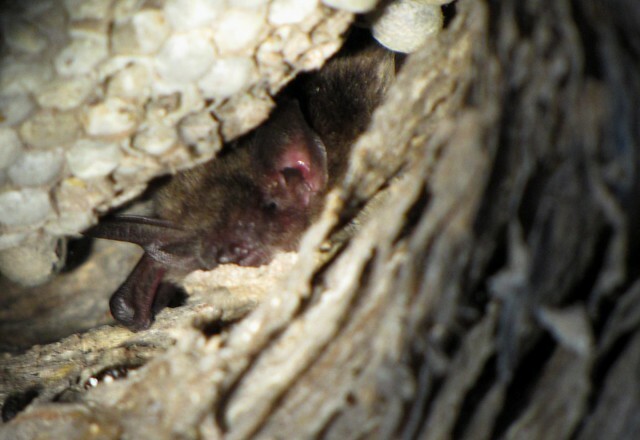 Since bats can live up to 30 years, this time span for an individual is not unusual. As long as I don’t knock down the nest and nature allows for it to remain in place, I am confident this night creature will return for many more years. I will have plenty of time to observe him and to count his droppings.